Just time for a short post this morning, and then hopefully something longer in a few days. I’m still pondering this idea of inclusion and hospitality as an overlooked aspect of God’s character. This past week I’ve been noticing how good it feels to be included when friends come together. Whether it’s a party, an invitation to lunch, or simply a cup of coffee, there’s something in our hearts – even for introverts like me – that yearns for inclusion. The culture here is inclusive. Check out the picture below. I snapped it last night (Sunday) at 10:00 pm on the “walking street.” Nothing special happening. 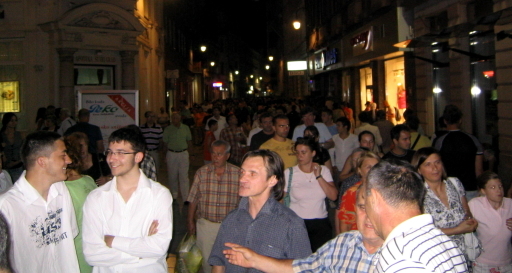 This is just a typical night in Sarajevo. And this is one of the things I miss when I come home to the states. Nothing was happening? Ha ha ha, go Don!